It has already been shown time and time again that live chat software increases conversion rates. But equally important is how intuitive it is for chat operators to use, and how responsive it is to both visitors and customers seeking more information or needing help with an order. A poorly designed, awkward and clunky chat screen is potentially worse than no live chat at all. In the years that have passed since the original live chat software review was posted here, many things have changed. Customers demand even faster responses and mobile-friendly options. Website owners look for greater customizability and innovative features that make juggling multiple chats easy and straightforward. That being said, I took a look at the original programs profiled to see what’s changed, as well as some new live chat solutions that have emerged as worthy competitors to see which ones truly win over both brands and the customers they serve. I tested these programs in much the same way as a potential customer would. I installed them where possible (to get the perspective from a site owner’s point of view) and used them as a person looking for clarification on some of the program’s features. I gauged the chat’s responsiveness, ease of use, and any other features it may have included like transcripts, mouse tracking and so on. “Get in your customers’ pants” … You keep using that word. I do not think it means what you think it means. LivePerson is live chat for enterprise-grade companies, and it leaves no guesswork in its aim to cater to the corporate segment. Throwing around terms like “asynchronous conversations” and “IVR through SMS”, you’d be forgiven for wanting to have a dictionary nearby to decipher what terms like these bring to your company. LivePerson allows you to gather vital customer information including name, account details, website actions before initializing the live chat, cart value, error messages and much more. It also integrates with a variety of CRMs and web-based applications including Salesforce, SugarCRM and Zendesk. Analytical details include how long the customer was engaged with the agent via chat, log in length, customer satisfaction ratings and much more. Pricing can be a bit confusing. For example, with the free plan you can have unlimited chats but only one agent. With the small business plan which starts at $18/month, you are limited to 12 chats a month but unlimited agents. Pricing varies from that point on depending on how many agents you want have and how many chats you foresee them having with your customers (as if anyone could know that in advance). Why hold yourself back with the very features that are supposed to empower your business and your customers? Throw in the mention of “150 content banners/month” on the free plan, but no mention of this feature anywhere else – nor any examples of what constitutes a “content banner” and LivePerson can make even the most patient website owner throw up their hands in frustration. The Verdict: LivePerson tries hard to be all things to all people, but doesn’t really flourish in any one area. Features are on par with other solutions and pricing can be restrictive if you don’t know exactly what you want before you order. 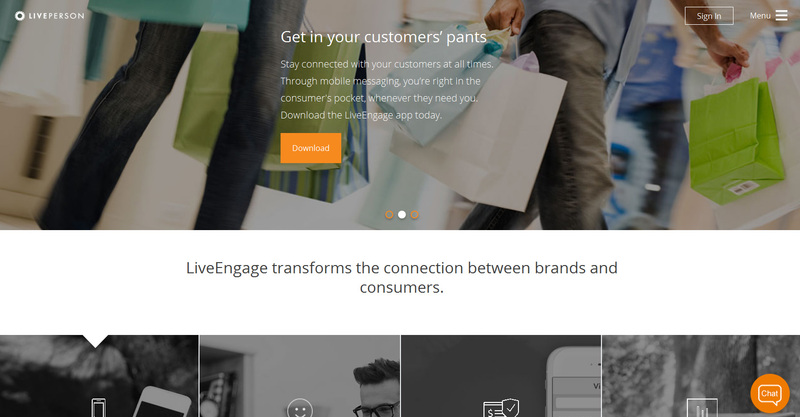 SnapEngage is built on the premise of integration from wherever you are. It works seamlessly with desk.com, Salesforce, Basecamp and many other popular CRM solutions. It detects and optimizes for mobile automatically, so responsive chats are as fluid and interactive as you’d expect from an enterprise-grade solution. Not surprisingly, in a nod toward enterprise, SnapEngage also conforms to PCI standards and HIPAA for greater security in both e-commerce and healthcare related fields. You can monitor chat and visitor activity in real-time and integrate SnapEngage with Google Analytics to measure the impact on your conversion rate. For developers, the SnapEngage API is available for advanced customization and integration. Chat operators can log in from any location and use pre-formatted text commands to quickly and efficiently answer questions without the appearance of a “canned message” response. Operators can also search their company knowledgebase directly in chat, for fast resolution of support issues and general troubleshooting. Perhaps the feature that’s most innovative when it comes to SnapEngage is its Social Discovery option. If a visitor provides you with their email address in the live chat session, Social Discovery can search for that email address’ in connection with profiles on Twitter, Facebook, Klout and 20+ other social networks. This information in turn can be added to the aforementioned CRMs that SnapEngage supports. One of the major downsides of SnapEngage, despite all its unique features is that you can only collect data on visitors once they’ve submitted a chat request, whereas many of the other solutions reviewed here will proactively collect that information for you where possible. You also cannot initiate a live chat manually. If no one replies, a trigger can be set to leave a message, otherwise an automatic chat box will come up after a set amount of time passes. Currently there is no way to change this. The Verdict: If you’re heavily invested in social media, SnapEngage’s Social Discovery feature is an easy, accessible way to get valuable details about your customers. For users in the e-commerce or healthcare fields, having added security and compliance features is a definite plus. SnapEngage pricing starts at $60/month for up to 4 agents (each additional agent costs $25) and enterprise-level plans are available. From both the customer and operator’s point of view, PureChat is both intuitive and simple. The chat box is unobtrusive and can be customized with its own color scheme and agent photo. PureChat also works as a native app on iOS (Apple), Android and Kindle devices, letting you enjoy the freedom to be where you want and connect with customers without being tied down at your desk. With PureChat, live chat transcripts can be saved and stored in order to identify your top performers as well as discuss new opportunities for lead engagement. Pre-filled responses are available to help address consumers’ most common questions and setting up the system can be done in just a few minutes. PureChat focuses on one thing and one thing only – and that’s live chat. It integrates beautifully with popular web-based content management, social media and e-commerce services, including WordPress, Shopify, Etsy and Facebook, so it’s easy for anyone looking for a quick, no-nonsense live chat solution to be up and running with fast. 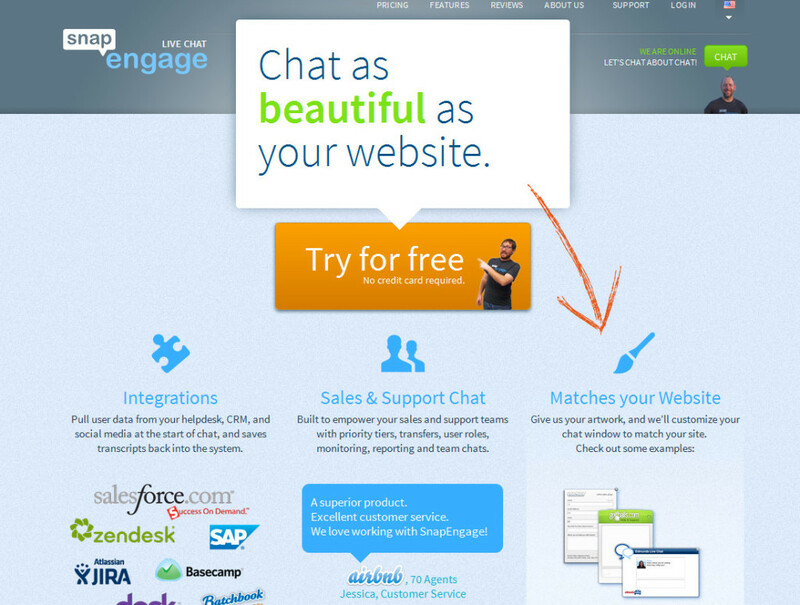 I tried very hard to find a flaw with PureChat, especially considering that it’s free. But from a live chat integration, ease of use and customization point of view, I couldn’t. The analytics were there, the ability to have multiple operators was there, and the mobile functionality was there. Even the third party integrations far surpass what other companies are charging for. If anything, you may be put off by the need for having to hire a developer to do more in depth customization and detailed integration, but the fact that so much of the heavy lifting of that integration is handled with Zapier (which is as code-free as it gets), the team at PureChat has made all the typical barriers to entry as low as possible. The Verdict: They do one thing and do it phenomenally well. If you’re looking for live chat with other features bolted on like voice, support desks and such, PureChat may be too simple for your needs, but if you just want a free live chat solution with third party integrations and mobile functionality, this is it. Pricing starts at $0 (yes, free) for up to 15 chats per month. For the integrations feature (Google Analytics, Zapier, Infusionsoft), the price is just $15/month. 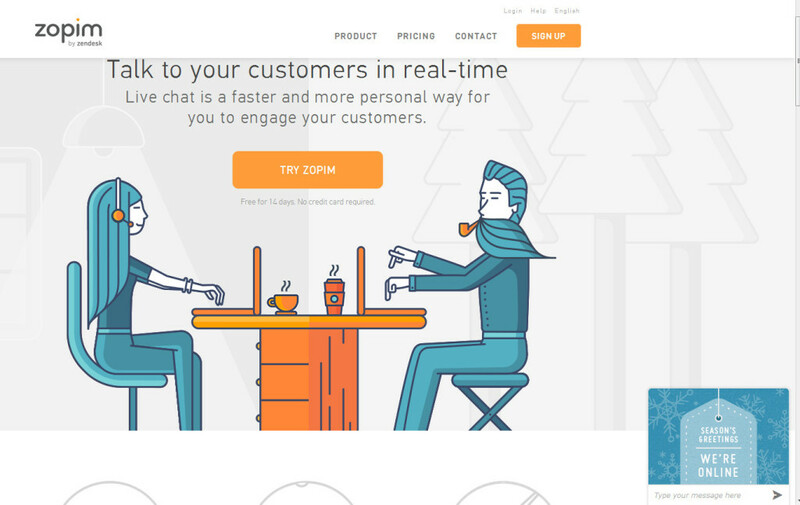 Owned by Zendesk, Zopim is not exactly a newcomer to the live chat world. It is, however on the smaller side of the pricing scale – making it a choice worth looking at for startups and small businesses alike. Zopim is extremely customizable in terms of letting you choose a template (seasonal designs are also available) or fine-tune the design to your liking. Not surprisingly, it integrates flawlessly with Zendesk. It also works alongside Salesforce, Magento, WordPress and a handful of other web-based services. If you need a live chat option for these platforms and want to set something up quickly and easily – Zopim may be a good fit. A free version of Zopim is available, however it can be very restrictive in terms of what you can and cannot do. For example, by default, the free version shows a “We are Offline” image when the chat is unattended. 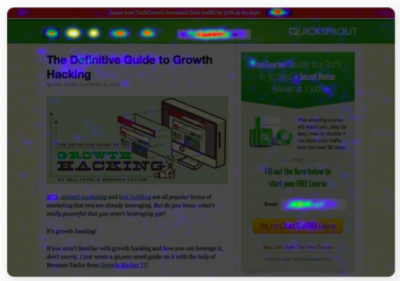 This may present your visitors with the wrong impression – that they (mistakenly) can’t get support through other means. The next plan up (paid) allows you to hide this option plus offers greater customizability on what you can edit. Zopim’s feature listing and pricing comparison chart is a bit confusing. For example, it states that Zopim works with a variety of third party CRM products and services – yet each tier of service states “Only 1” with regard to that option. Likely this is to push you toward using Zendesk instead – but why be so restrictive? Zopim does perform admirably where analytics are concerned. 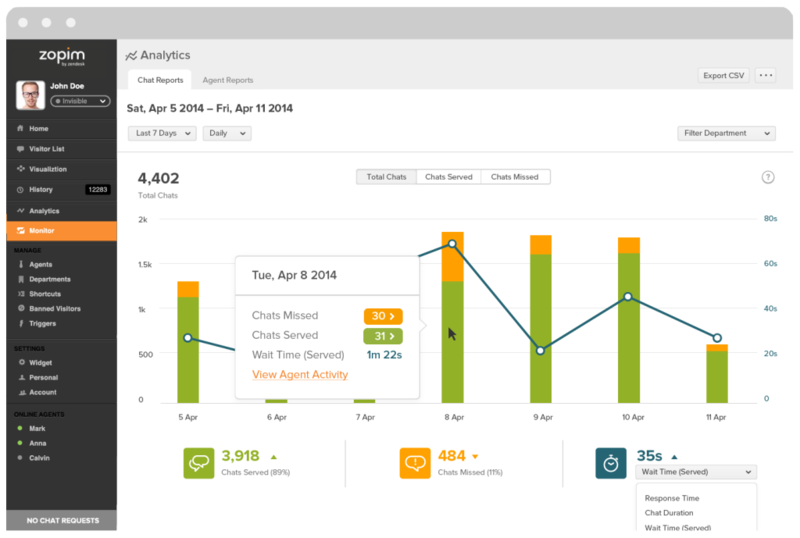 You can easily see how your agents are performing, what pages visitors are on before they reach out to you, and track chat logs and data over time. From an operator’s point of view, this is extremely helpful. However, from a visitor’s point of view, it can be frustrating. For example, in order to simply initiate a live chat, Zopim required my email address on their site. I’d consider that an instant conversion killer. This feature can be disabled, however. The Verdict: Zopim has a great little bundle of analytical features and integrations with popular web-based services and content management systems. It’s easy to get up and running quickly and works flawlessly with Zendesk (no surprise there). Pricing is confusing and message tailoring can give visitors the wrong impression. Free option aside, you can pay as little as $11.20/month for the Basic plan if you choose to be billed annually. Still, for a few dollars more, other live chat solutions in this review offered far more features with far less restrictions – so unless you’re a loyal Zendesk user, you may be better off trying some of the others for a greater range of options. BoldChat comes in three bold flavors: Pro, Premier and Enterprise – each with their own respective functions and features. Pro and Premier offer pretty much the same range of features including desktop and mobile-based chat options, chat screen and button customizability, proactive manual and automatic chat initiation. The only major differences between these two versions is the ability to set your own custom canned messages, integration with Salesforce and chat load distribution between agents. BoldChat is copy and paste quick to set up and easy to customize. Because the service is owned by LogMeIn, it works together easily with LogMeIn’s own “sale rescue” technology, known as Active Assist. Active Assist allows for screen sharing or remote use of the client’s computer and co-browsing functionality – even after a computer reboot. This makes it ideal for businesses where more hands-on support is needed to complete the sale. The vast majority of desired features are relegated to the Enterprise level plan. These include things like email and Twitter management, app integration, translation functionality and much more. Even things that are standard on other plans, like third party integration, are restricted for Enterprise-level users only. The Verdict: If you’re already using one of LogMeIn’s other systems like Rescue, having the “sale save” feature could make a significant difference to your bottom line. Otherwise, other live chat services offer many more features at a substantially lower price. Considering that the lowest price plan will set you back nearly $600 per agent per year, you’d need to see some concrete ROI to balance out the considerable investment you’d made in BoldChat’s plans. BoldChat’s Pro plan starts at $599 per agent per year with the Premier and Enterprise plans available at quoted rates. ClickDesk is less of a live chat solution and more of a well-rounded all-in-one product that anticipates the needs of potential customers far beyond what website live chat can do. 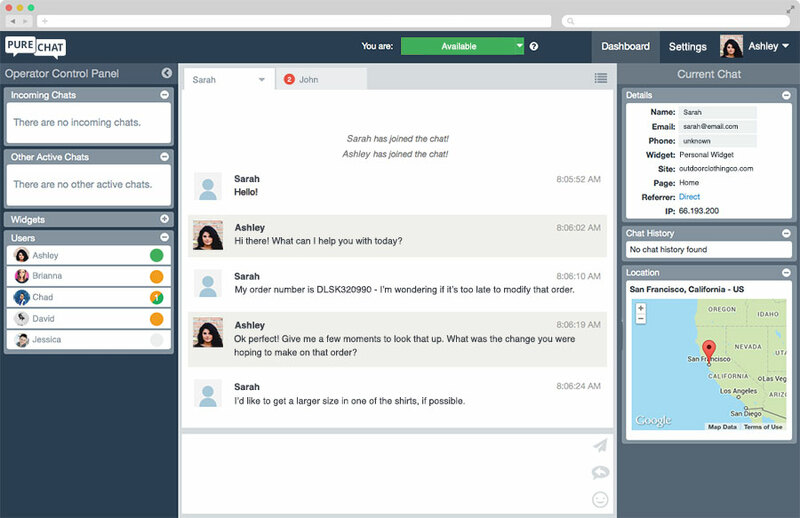 For example, ClickDesk allows you to videoconference or conduct live chat calls via Skype or Google Talk. Beyond the live chat interface, a simple Helpdesk/Ticket solution is also integrated within the system – letting you and your agents address customer concerns outside of the chat box. ClickDesk also integrates with a variety of popular platforms and content management systems including WordPress, Joomla, Tumblr and Magento as well as popular marketing services like MailChimp and Unbounce. Design customization with ClickDesk is more limited than with other providers, in that your customization is limited to several pre-made themes. The themes themselves are not mobile-responsive, however a smaller version of the chat icon does appear for mobile users and they can still conduct a live chat through their preferred device. Like Zopim, ClickDesk requires an email address before a live chat can begin however this setting can be turned off. ClickDesk offers no live analytics information. Visitor details are only provided when a chat is initiated. There are a wide range of event trigger and proactive chat options too, however the only way to deactivate these is to delete them. From a technical standpoint, some of the features may seem a bit clunky, but they are improving all the time. The Verdict: ClickDesk could start implementing real-time analytics and a little smoother technical operation and it would quickly rise through the live chat review rankings. If you can live with these few minor annoyances though, it’s worth a look – especially considering the bonus videoconferencing and helpdesk/ticket system features not typically found in other chat programs. Pricing for ClickDesk starts at $16.99/month. Features like Video Chat, surveys and reports/history are available at the second tiered plan at $21.99/month. The second level plan also gives you access to third party integrations and the developer API. Comm100, while it sounds more like a college course than a live chat provider, has made significant improvements in its chat program over the past couple of years. It offers all the features you’d expect from a higher priced plan but without the added price tag, making it a worthwhile contender for businesses of all sizes. With built in features like unlimited chats, automatic greetings, real-time visitor monitoring and extensive customization, there’s virtually nothing Comm100 doesn’t offer – even in its lowest priced plan. Because it’s a hosted solution, nearly everything can be changed to suit your brand and color scheme, and you don’t need to worry about complicated installations or scripts – just a simple copy and paste. Comm100 also has several integrations with popular plugins and content management systems including WordPress, Joomla, Shopify, Magento and Drupal making it a breeze to set up if you use one of these platforms. Some of the more desirable features, like the ability to remove the Comm100 “Powered by” branding, the ability to add custom fields and variables, and integrations with third party tools like Salesforce, Zendesk and Google Analytics require an upgraded plan to use. Fortunately, nothing is held back in terms of customization, even on the lowest price plan. The Verdict: Comm100 has come a long way in recent years to be one of the foremost choices worth considering for businesses large and small. Its Team plan is packed with features, though for tighter integration, you’ll want to upgrade to Business. If you’re concerned about outages, being that it is a hosted service, a third tiered plan set at $75 per operator per month includes the company’s own MaximumOn Technology which keeps your chat running even if their servers go down. Pricing starts at $29 per operator per month with unlimited chats, customization, monitoring and mobile options. A little bit more than your average live chat program, SmartSupp, based out of the Czech Republic, lets you record and track visitor mouse movements and clicks directly from your agent dashboard. Its conditional message system lets you send messages based on the conditions you specify, helping you engage with your visitor without costing you time. The live chat dashboard is clean, uncluttered and intuitive, making it easy for you to actively chat with interested visitors while gauging their reaction based on the recording of their site activity. 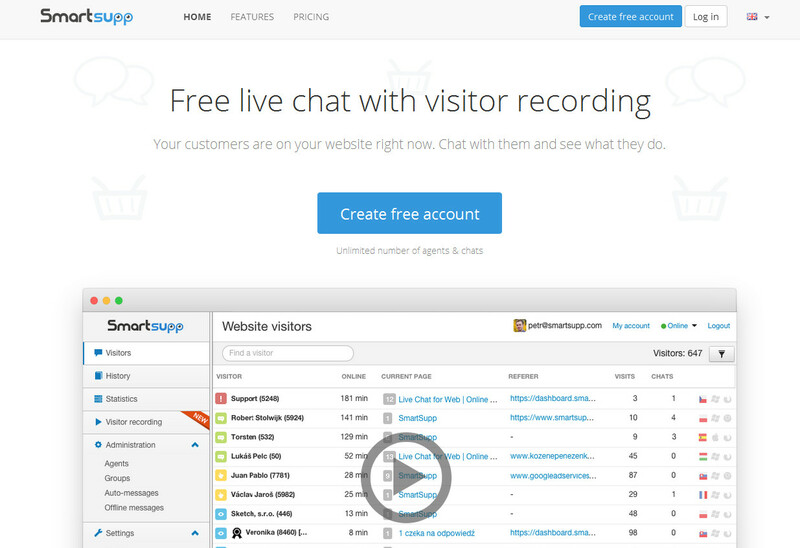 Like the many other live chat programs featured in this review, SmartSupp works with popular services and platforms like WordPress, Shopify, Magento and more. Live chats from SmartSupp are also mobile friendly, letting you chat with visitors no matter where you are. Chat windows are easily customizable, with deeper customization available through the API. With all its options for tracking and monitoring, SmartSupp is lacking some of the common features one might expect from a more robust live chat solution including the ability for prospects to have the agent call them directly or browse alongside them. Branding the chat with your own look and feel is also very limited. The Verdict: If you’re looking for a free live chat service with the option to use unlimited agents, as well as video monitoring and mouse tracking capabilities, give SmartSupp a serious look. Support is second to none and being able to reach out to someone when you need help makes SmartSupp stand out from its competition. Pricing is available starting at 8 euros/month making it ideal for E.U. communities and countries. You can also save up to 20% by choosing the annual billing option. Kayako Engage naturally connects to its own helpdesk, letting you and your agents serve customers proactively in a way that fits their needs. Chats can be organized, assigned and routed to the appropriate people and departments with the click of a button. What’s more, if you’re a diehard user of a specific instant messaging app, there’s a good chance it works with Kayako Engage. This is made possible through their Chat Gateway service, a cloud-based option that lets you use any IM (Jabber/XML) capable software to conduct your live chats. This service is currently in beta though, so expect the occasional oddity if you plan to test it out. Currently, Kayako doesn’t currently integrate with other kinds of remote support software. It also uses its own reporting language (similar to SQL), which you’ll want to learn in order to get the most out of its robust support tools. Tasks that should ordinarily be easy, such as creating an automated support email account, are unusually complex. 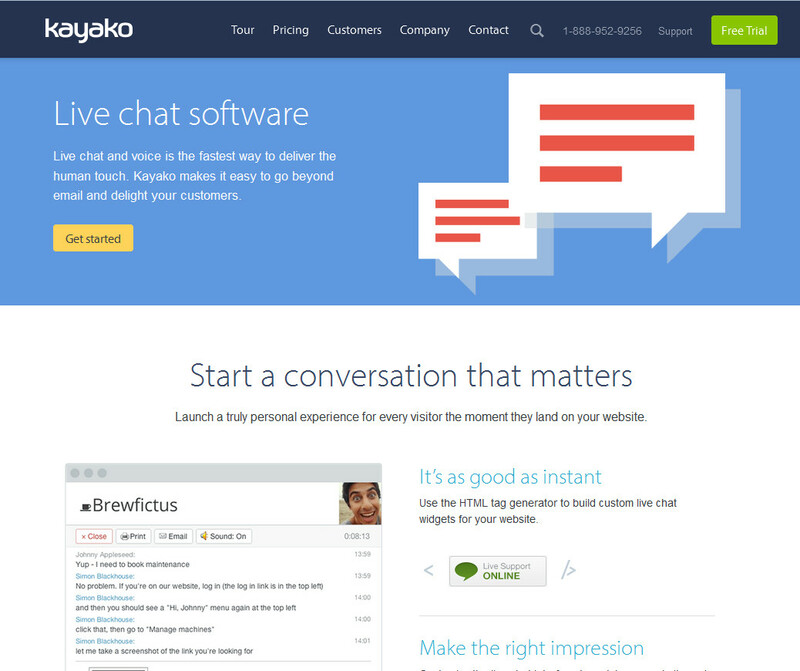 The Verdict: If you’re used to working with Kayako through one of their other products, like their helpdesk, adding their live chat shouldn’t hold you back. Being familiar with their system is a definite plus when considering live chat. 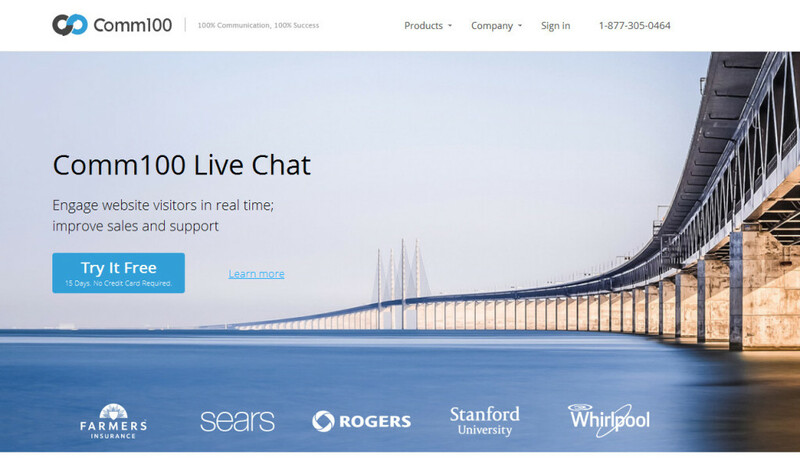 If you’re new to the system and want something a bit more feature-full, you may want to try one of the other live chat products I’ve profiled here. Kayako Engage costs $24 per agent per month and is billed annually, $29 per agent per month when billed monthly. LiveHelpNow is a full service customer management suite that integrates live chat, ticket-based support, call management and a knowledgebase. If you need live chat functionality, but are looking for a little something extra, you’ll want to give LiveHelpNow a serious look. LiveHelpNow works with a variety of popular content management systems and e-commerce platforms including WordPress, Drupal, Magento, Prestashop and CS-Cart. Their publicly-available API hooks into any CRM program, and hands-on remote assistance functionality lets you work with the customer as if you were actually there. All of the features you want are available right out of the box. LiveHelpNow has its own analytics, but also plays well with Google Analytics too, enhancing its functionality to show you what you’ve been missing. With social insights, a feature that opens the visitor’s social network profiles during the chat, as well as real-time monitoring and exportable customer lists, you can glean valuable information even with minimum customer details. Here again, it’s hard to find flaws in LiveHelpNow’s system. There are so many flexible options available that it may be overkill for users who just want a live chat solution without everything else. 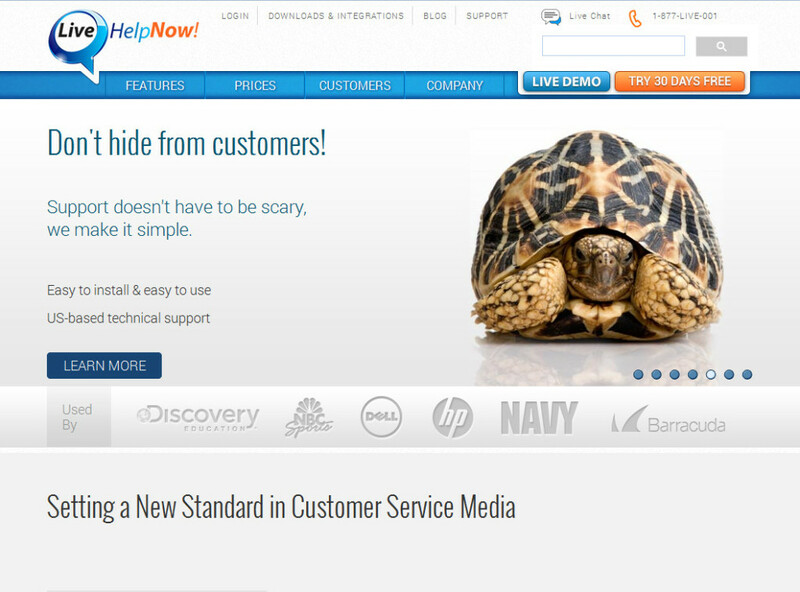 But if you want an all-in-one customer support system where each component stands on its own merits, give LiveHelpNow a try. The Verdict: Typically when a company that specializes in live chat ventures into other customer support service territories like help desks, trouble tickets and knowledgebases, the features of those respective services are sorely lacking compared to the company’s flagship product. That’s definitely not the case with LiveHelpNow, where each option provides a standalone strength that’s further enhanced by the fact that you can use them together for a well-rounded, reliable service. Website Alive is simple to set up and easy to customize. A simple user interface editor makes it easy to create your own look and feel without programming. Real-time metrics and live visitor monitoring shows you who’s interacting with your site and present you with opportunities to proactively initiate chats if needed. Other features like routing, queuing, surveys and the ability to email transcripts. At $50 per month (for 2 licenses) and an additional $20 per month per license for the lowest priced package, WebsiteAlive could cost a bit more than the rest of the plans profiled here. Screen sharing, which is standard on many plans, costs extra with WebsiteAlive. Still, if you need easy-to-use, brandable chat with visitor monitoring and surveys as well as detailed agent transfer and routing capabilities for multiple chats and multiple agents, WebsiteAlive is one of the better choices. The Verdict: Overall, WebsiteAlive offers many features not found in other live chat solutions, including the ability to work with trained professional agents to help convert more clicks into customers. If you need live chat for your website without all the bells and whistles, WebsiteAlive is a good mid-range solution worth checking out. Velaro’s lowest priced plan is competitively priced and includes an easy-to-follow wizard to get your live chat service set up right away. With common features like before and after chat surveys, department routing, full customizability and detailed reporting (including Google Analytics), Velaro has a good deal of services that are priced well at different levels. Its next tiered plan, at $99.95 per agent per month may seem a bit pricey at first glance, but when you delve deeper into it, you’ll see some innovative features that no other chat solutions have, such as multi-step conversion tracking and detailed reports including advanced geo-targeting. Velaro also integrates with a wide range of third party systems including Google Analytics, Google Translate, Salesforce, Netsuite, SugarCRM and Microsoft Dynamics. More integrated third party systems like Vonage and Twilio are available at the enterprise level. The Smart Business package, which is the second tier of pricing, would benefit from the Remote Desktop feature which is often needed for technical support beyond what a simple live chat solution can provide. What’s more, the click-to-call feature, a standard of many live chat services, is only available for enterprise users. 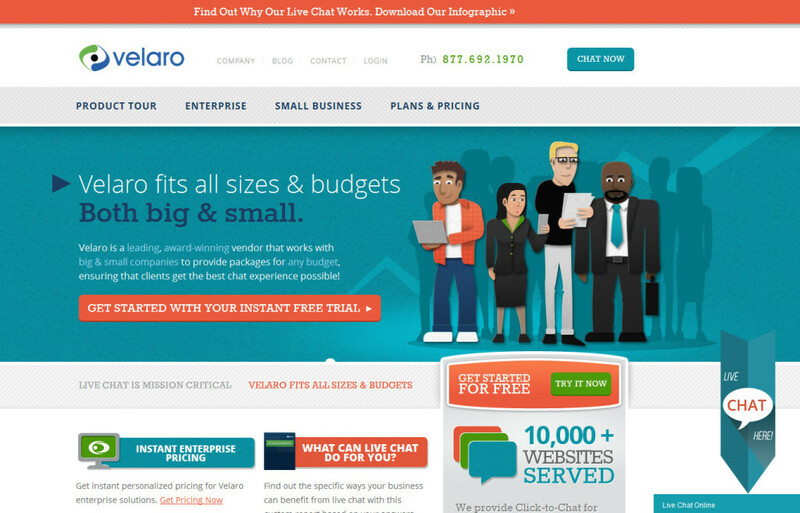 The Verdict: Velaro is a solid choice for small and medium businesses alike. If you’re looking for chat that allows more hands-on interaction with your customers however, you may want to look elsewhere. Still, with full customizability, file transfer and real-time monitoring available as standard, you’d be hard-pressed to find a more versatile live chat package at this price. Velaro’s pricing starts at $29.95 per month per agent with more features enabled at the Smart Business Plan Tier for $99.95 per month per agent. 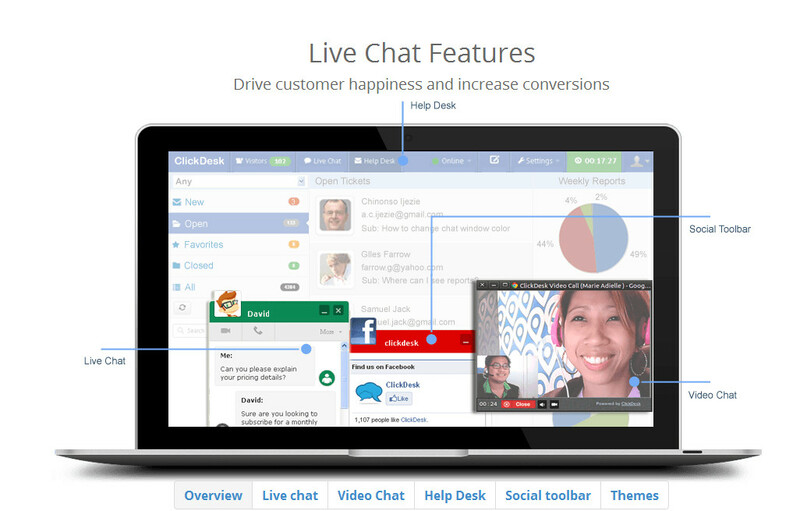 Which Live Chat Program is Right for You? Each of the live chat solutions profiled here offers a free trial or the ability to request a demo, so if you’re leaning toward using one or the other, give them both a try and see which one performs the best for your needs. I’ve profiled a lot of different systems here, so it’s a good idea to make a shortlist of the must-have features you need, and then compare the choices that best meet your budget and number of operators to determine which one would be the best fit. Don’t forget to that you can split test between different live chat programs to see which one best converts for you. Many of these chat systems integrate with Google Analytics and some even allow for advanced segmentation, so take advantage of these features if they’re available to see how much live chat can improve your overall conversion rate. And of course, this is by no means a comprehensive list of all the latest live chat systems on the web. If you have one I’ve missed, tell me about it in the comments below!